in this lesson. In the table below you will see the number of the question and to the right a link to the paragraph of the doctrine where the question and answer originated. 1] Sin is the transgression of God's law-the falling short or missing the mark of the character of Jesus Christ. Although the penalty for sin is death in the lake of fire, all sin can be completely forgiven by God who desires that all men be saved. God forgives sin upon the repentance of the individual who accepts the shed blood and sacrifice of Jesus Christ as payment in full for the penalty of his sins. 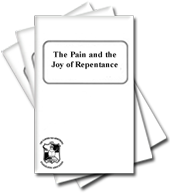 2] The most consistent and important theme of the New Testament concerning sin is that it will be gladly forgiven by God upon any human being's repentance, acceptance of the shed blood and sacrifice of Jesus Christ, and baptism. Hence, sin need not have "dominion" over a Christian (Romans 6:12), nor must it "reign" over his life (Romans 6:12), nor block his entrance into the Kingdom of God! 3] Sin is "all unrighteousness" (I John 5:17); "for sin is the transgression of the law" (1 John 3:4, KJV or "lawlessness," RSV). Sin, in fact, cannot be imputed when there is no law (Romans 5:13), "where there is no law, there is no transgression" (Romans 4:15). 4] The seventh chapter of Romans deals with the relationship between sin and law. Paul wrote, "If it had not been for the law, I should not have known sin" (Romans 7:7). Using the tenth commandment as his example, Paul continued, "I should not have known what it is to covet if the law had not said, 'You shall not covet'." Paul explained that sin is made obvious because the law condemns it. "For sin, finding opportunity in the commandment, deceived me and by it killed me" (v. 11). 5] But this in no way maligns the law as some would quickly and erroneously conclude. Paul immediately thwarted this false concept by writing, "So the law is holy, and the commandment is holy and just and good. Did that which is good, then, bring death to me? By no means! It was sin, working death in me through what is good, in order that sin might be shown to be sin, and through the commandment might become sinful beyond measure" (verses 12-13). 6] Sin is more than the breaking of one of the Ten Commandments in an outward, physical manner. Christ amplified the law of God to include the spirit and intent of the law. Likewise, this amplified the meaning of sin to include the breaking of the spirit or intent of the law through one's actions or attitudes. For example, the New Testament expands the law so that looking upon a woman to lust after her is the moral equivalent of adultery and thereby sinful; so that hating one's brother is the moral equivalent of murder and sinful. Thus one appearing outwardly righteous may inwardly harbor all sorts of evil. 7] Such external appearances of righteousness can often lead to self-righteousness, perhaps the most insidious of sins since it is so difficult for the person himself to comprehend since he "knows" that he hasn't done anything wrong. Christ spoke pointedly against this type of hypocrisy which is common to men. 8] Paul understood the universal power of sin. It permeates every nation, every race, every citizen of planet earth. "None is righteous, no, not one; no one understands, no one seeks for God" (Romans 3:10-11; Psalms 14:1-3; 53:1-3); "For all have sinned, and come short of the glory of God" (Romans 3:23). Sin envelops every human life. On the one hand; sin includes much more than just our occasional wicked actions. On the other hand, true sinlessness is more, much more, than just the outward adherence to any set of behavioral regulations and/or religious rituals. Paul saw this clearly in his own life, "For I do not do the good I want, but the evil I do not want is what I do . . . . For I delight in the law of God, in my inmost self, but I see in my members another law at war with the law of my mind and making me captive to the law of sin which dwells in my members" (Romans 7:19, 22, 23). All is not hopeless, indeed the recognition of the full reality of the almost omnipresent problem of sin in one's life is the first step toward-indeed it's the major part of-the solution to the problem. "Wretched man that I am! Who will deliver me from this body of death? Thanks be to God through Jesus Christ our Lord! So then, I of myself serve the law of God with my mind, but with my flesh I serve the law of sin. There is therefore now no condemnation for those who are in Christ Jesus. For the law of the Spirit of life in Christ Jesus has set me free from the law of sin and death" (Romans 7:24-8:2). 9] In addition to being the breaking of God's law, sin is also the result of falling short of God's way of life. The two concepts overlap greatly, but stress different approaches. There are two basic ways of life, one of "giving" and the other of "getting." God's way is the giving way; that of outgoing concern for and understanding of others; it is the way of love which is God's primary characteristic. Man's way is the way of "get"; of vanity, jealousy, lust and greed; it is the way of satisfying his own desires without care or concern of others. God defines His way by His law. When man breaks that law and thereby sins, he falls short of God's perfect way. 11] James referred to sins of omission when he wrote, "Whoever knows what is right to do and fails to do it, for him it is a sin" (James 4:17). Sin, therefore, is expanded beyond its traditional (albeit fully valid) "thou shall not" boundaries. Not doing wrong is no longer sufficient to keep one from sinning. Affirmative positive action is obligatory for an individual to do in certain situations or sin will result. If the person does not do what he knows is right to do (for whatever reason, e.g. laziness, inconvenience, etc. ), then that is just as much a sin as the direct breaking of any of God's law. Not helping the poor, for example, when one is able (either by giving of one's time or his resources) is a sin; not going out of your way to sacrifice and show outgoing concern for one's parents, children, spouse, relatives, friends, strangers or enemies may violate James 4:17 and become a sin if one knows that it would have been proper to do, but yet neglectfully did not do it. 12] Although sin and the breaking of God's holy way of life ultimately originates in the mind, mere temptation to sin is not sin, however strong the temptation may be. Christ was tempted by Satan in all points and in every respect but never sinned (cf. Matthew. 4:1; Hebrews 4:15). No temptation should make a Christian feel guilty; temptations are normal, but they must be instantly resisted because the line between temptation and sin may become fine indeed. James expressed it this way: "But each person is tempted when he is lured and enticed by his own desire. Then desire when it has conceived gives birth to sin, and sin when it is full grown brings forth death" (James. 1:14-15). As this verse and others point out, the ultimate penalty for all sin is the second death in the lake of fire (Romans 6:23; Revelation 20:14-15 ). 15] Satan likewise introduced sin to mankind through Adam and Eve. Although created in moral and spiritual neutrality, Adam and his wife were deceived by Satan into disobeying God's command that they must not eat of the tree of the knowledge of good and evil. In turn all since Adam and Eve (except Jesus) have sinned and themselves incurred the death penalty for their own sins. "Wherefore, as by one man sin entered into the world, and death by sin: and so death passed upon all man, for that all have sinned..." (Romans 5:12). 16] Sin can be either by omission or commission, individual or national, affecting others or affecting only the self. But in the final analysis, all sin is against God, because God is the author of the law against which man transgresses (Psalms 51:4). While the types of sin are as numerous and varied as human beings, the effects of sin are direct and specific. As explained, the final penalty for all sin is death in the lake of fire. But sin has other effects. 17] Sin makes people miserable; it ruins their lives and their families; it maims, devastates and kills; it is the cause of all human misery and suffering. This is why God hates sin so much-not because of what sin does to God, but because of what sin does to sinners whom God loves. Furthermore, sin perverts the mind; it can change the values of the sinner, his point of view and outlook, and make him rationalize that he is doing right when he is actually doing wrong. Sin blinds and deceives the sinner by causing a veil to fall over his eyes so that he cannot understand the reality of God's truth as expressed in the Bible. More importantly, it cuts one off from God. "Behold, the Lord's hand is not shortened, that it cannot save; neither his ear heavy, that it cannot hear: but your iniquities have separated between you and your God, and your sins have hid his face from you, that he will not hear" (Isaiah 59:1-2). 18] Sin is the absolute antithesis of God, the opposite of everything He represents and for which He stands. Thus the sinner can never be given eternal life as a member of God's family until all sin has been wiped away from his life-until it has been repented of and forgiven by God. This forgiveness is available only through the sacrifice of Christ upon repentance (Acts 2:38). But it is freely and fully given to all who ask. There is no sin that God won't forgive, if the sinner is truly repentant. 19] Repentance is a gift from God. It comes when God opens one's eyes to recognize his own sinfulness, and to see that his life has been a constant journey of self-centered vanity in defiance of God. Once one has acknowledged the reality of his sins, and has come to the heartfelt determination to change to a new life with Christ's help, he can be baptized and receive total forgiveness for his sins. But repentance is not a one-time thing. Rather, one must repent of additional sins as he becomes aware of them; the now converted Christian must confess them before God on a daily basis. 20] It is crucial that Christians deeply realize that God does not forgive sin begrudgingly. He is quick to forgive lovingly and mercifully any repentant person of any and all sins, no matter what their magnitude, number or frequency may be-and then permanently block even the memory of those sins from his mind for eternity. God says he "hath not dealt with us after our sins; nor rewarded us according to our iniquities. For as the heaven is high above the earth, so great is his mercy toward them that fear him. As far as the east is from the west, so far hath he removed our transgressions from us. Like as a father pitieth his children, so the Lord pitieth them that fear him. For he knows our frame; he remembers that we are dust" (Psalms. 103:10-14). 21] One with God's Spirit is under no "condemnation" whatsoever in spite of the fact that he must still wrestle, against sin and may on occasion succumb to sin (cf. Romans 7; 8:1). Such a converted person is not counted as a "sinner" although he may indeed sin out of weakness. He is rather looked upon by God as "holy" (Col. 3:12) because God imputes His righteousness to him through faith (Romans 4). Only one who has had the burden of the penalty of sin completely lifted from his shoulders and has experienced the deep exhilaration of knowing that his every sin has been totally forgiven and forgotten by God can fully appreciate David's statement, "Blessed are they whose iniquities are forgiven, and whose sins are covered. Blessed is the man to whom the Lord will not impute sin" (Romans 4:7-8; Psalms 32:1-2). Such a person has been given the "joy and gladness" which comes from having peace with God (Psalms. 51:8). A forgiven Christian knows he need not feel hopeless if he sins in weakness, because God looks upon the heart (1 Sam. 16:7). He realizes that God hates sin but loves the sinners enough to have sent His only Son as their Savior. "For God so loved the world, that he gave his only begotten Son, that whosoever believeth in him should not perish, but have everlasting life" (John. 3:16). 22] God can appreciate our human frailty because Jesus Christ, our mediator and intercessor, is always at His right hand. To Jesus, sin is not some theoretical theological concept; for He experienced the full force of temptation in all points of human susceptibility (Hebrews 4:15). He also experienced the full force of the penalty of sin. Though he never sinned, Jesus can well remember the enormity of the incessant battle, constantly resisting Satan's wiles and ceaselessly fighting his own human nature. Jesus will never condone sin; but He will understand it, he will never condemn the person for it, and He will always be extremely desirous of asking God to forgive it. 23] God in His perfect wisdom knows that not all men will repent of their sins or accept the sacrifice of Christ. Some will absolutely decide, of their own free will and volition, while knowing better, never to obey God and never to repent. Hence, a person who has steeled and hardened his mind against repentance is a person who cannot be forgiven, not because God will not forgive him, but because the person himself does not want to be forgiven. This Sin, against the Holy Spirit, (which is the Agency by which God removes sin,) is called "unpardonable", not because God lacks the power to pardon it, but because the sinner has rejected God, and His Holy Spirit, and refuses to ask for pardon. Those who accused Jesus of performing miracles through the power of Satan were perilously close to that ultimate hardness of heart which will refuse to repent, and therefore refuses to ask God's pardon for sin. The lake of fire is the ultimate penalty for one who commits this unpardonable sin. But, the great God who created the universe will only destroy an individual for whom eternal life would become unending misery, the ultimate torture of terrible frustration. 24] Yet it must be emphasized and understood that anyone, at any time, can and will be able to repent of any sin when he sincerely desires to be forgiven and to accept Jesus Christ as his personal Savior. This is God's will for all mankind-"Not wishing that any should perish, but that all should reach repentance" (2 Peter 3:9; cf 1 Timothy 2:4). Even Paul, as we saw, had his problems of not always living the way he should-of missing the mark-of not having the perfect attitude (Romans 7:15-23). Even he was influenced by Satan's attitudes and human covetousness. But he knew that Christ's sacrifice would forgive and cover all sin (Romans 7:25). 25] Thus, the unpardonable sin is not at all the fearsome weapon of a sadistic God who refuses to forgive a poor sinner who has made a few mistakes out of weakness. The opposite is the case. Anyone, at any time, can and will be able to repent of any and all sins simply by desiring to be forgiven and by accepting the blood of Christ as payment in full for the penalty of those sins. "Without the shedding of blood there is no forgiveness of sins" (Hebrews 9:22). It is only in Jesus Christ that "we have redemption through His blood, the forgiveness of our trespasses, according to the riches of His grace which he lavished upon us" (Ephesians 1:7). Redemption is through "the precious blood of Christ" (1 Peter 1:18-19), with which converted Christians were (and are continuously being) washed from their sins (Revelation 1:5-6). The crucifixion of Jesus Christ was "for all time a single sacrifice for sins" (Hebrews 10:12) because His life, as Creator of everything (Colossians 1:16), was more important than all other lives put together. 26] In connection with the topic of sin, many skeptics and sincere believers alike through the centuries have wondered why God allows sin to even exist: "If God is both all good and all powerful," they ask, "why does He allow such terrible evils on earth?" The answer is rooted more in the biblically stated purpose of human life than in the philosophically structured arguments of intellectual tradition. 27] God is, through man, reproducing Himself. In order to enable man to build righteous, character, God created his mind with free moral agency. This means that human beings have been given the right and capacity to make their own choices and to guide their own actions, thoughts, and lives. Therefore, in effect, God has given man the right and the capacity to do evil. Yet even this accomplishes God's purpose. For in allowing man to commit evil, God enables man also to learn a great lesson from the experience of the evil: that disobedience to God's ways, laws and principles will produce horrendous results. Once man has thoroughly and completely learned this hard, painful lesson of history-that disobedience of God produces destruction and death-he will never make the same fatal mistake Satan did; he will never rebel against God, because he knows such rebellion will produce only corruption and calamity. 28] While we need to deeply recognize the presence of sin in our lives as highlighted by God's law, we need to forgive and forget sin, just as God does (Psalms 103:12). This applies to both our own sins and the sins of others. One of the most common problems for true Christians, having been trained in, and imprinted by, puritanically based Western culture, is the continuing guilt complex over past sins ever after they are fully repented of and buried with Christ. As far as God is concerned, He sees no reason why the repentant person should feel guilty since He Himself will not even remember their sins. Christians, therefore, should grow toward having this same attitude regarding their own sins and (equally important) the sins of others. Once forgiven, all sins should be forgotten. 29] Certainly sin affects us all because all have sinned and come short of the glory of God (Romams 3:23). But sin-however heinous and antithetical to God's way-has become an intimate part of God's plan of reproducing Himself through mankind. God's forgiveness-the greatest expression of His total loving kindness and mercy-is the perfect antidote that completely nullifies and makes void Satan's efforts at turning man from his Creator.